High quality materials at an incredible value. a thoughtfully designed invitation suite & customize it with finishing touches to make it truly personal. 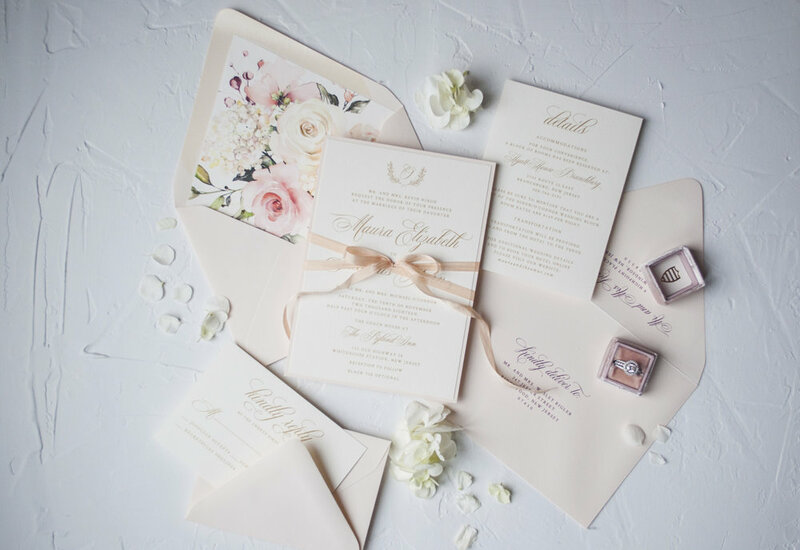 Timeless elegance, the Amelia invitation suite features rich gold text, a bold floral envelope liner and the most elegant script. Chic and sophisticated, the Kimberly Invitation features gorgeous script, a delicate hand drawn wreath with monogram and the most beautiful pale pink envelopes. Add a bold vintage peony envelope liner, a luxe hand-dyed silk ribbon and/or a wax seal to make this suite truly unique. The perfect mix of timeless and chic, the Sylvia Suite features delicate script, a gorgeous floral crest & beautiful flowing watercolor vines. The perfect mix of sophistication and whimsy, the Layla Suite features a classic script & blue and white florals reminiscent of a classic Chinoiserie pattern. Featuring a hand drawn floral wreath with monogram and the softest vintage pink rose envelope liner. The Grace is beyond romantic. Featuring a Florida map envelope liner, fun script font and gold ink, this destination wedding invitation suite is sure to get your guests excited to fly away with you. Customized to your destination. Inspired by Southern Plantation Weddings, the Carolina Suite features a beautiful vintage die cut shape, gold script and a delicate hand drawn wreath. Add a bold vintage floral envelope liner, wax seal and a lush silk ribbon to make this suite truly exceptional.